Thomas (Tom) James Price was the son of James Price and Jane James. The 1861 census shows him as Thomas J. Price aged 6 at Cloth Hall Row, Forchaman (Aberaman), Aberdare, Glamorgan but born in Tredegar, Monmouthshire. Engine driver Thomas James Price and Rosa Madia Thomas were married on August 7 1880 at the parish church in Llanfihangel Talyllyn, witnessed by John Thomas, Isabel Price and W H Price. Tom James Price's father was given as James George Price, grocer, and Rosa's father as Thomas Thomas, farmer. She was one of the Thomas family of Oakfield farm, Llanfihangel Talyllyn, Breconshire (Brecknockshire or Sir Frycheiniog in Welsh). 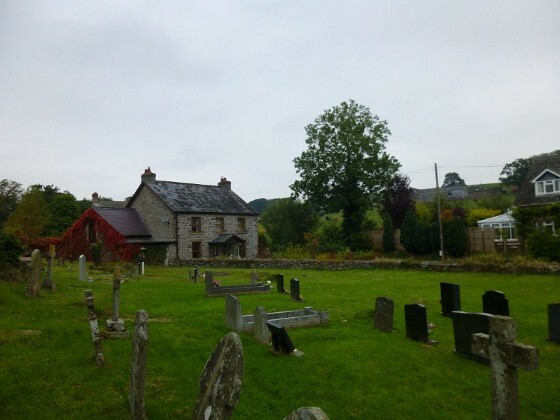 In the 1881 census, Thomas Price, 26, was living at 3 Cobbs Cottages, Llanfihangel Talyllyn, Breconshire with wife Roza M., 25, born Llanfihangel parish, infant daughter Mary I. Price and Thomas' sister Isabella S. Price, 23, a servant (out of place). Thomas James Price and Rosa Madia Price established a home at Wern Cottage, Llanfihangel Talyllyn. Tom Price was a railway engine driver and was bilingual. Rosa and their children were brought up speaking only English. 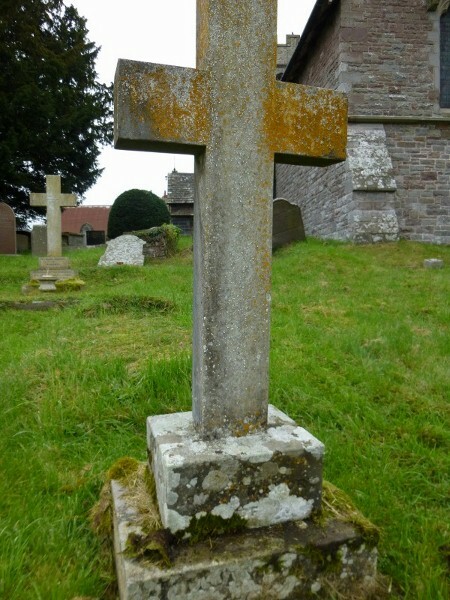 Thomas James Price died on March 23 1914 and was interred in Llanfihangel churchyard on March 26. His wife Rosa Madia Price died at 81 Woodlands Road, Barry, Glamorgan aged 80 and was buried in Llanfihangel Talyllyn on December 2 1935. Mary Jane Price (March 8 1880- March 21 1952). She married George Rowland Millington (November 24 1866- February 8 1944) in Sept Quarter 1908. The Free BMD image and transcription are ambiguous but note that her sister Rosa and brother Rees Price were with them in the 1911 census. (Hereford Times November 30 1912) GENERAL Wanted at once, small country house; 2 in family; plain cooking, washing; reference required; state wages. - Mrs Millington, Llangorse, Llanfihangel Talyllyn, Breconshire. Similar advertisements appeared in the Brecon County Times in September 1914 and August 1917, Mary Jane and George Millington were at 2 Heath Terrace, Leamington Spa in 1939 when George was a retired farmer. Both died in Leamington Spa with no known children. Rosa Madia Price (November 18 1881-1950, died Cardiff). 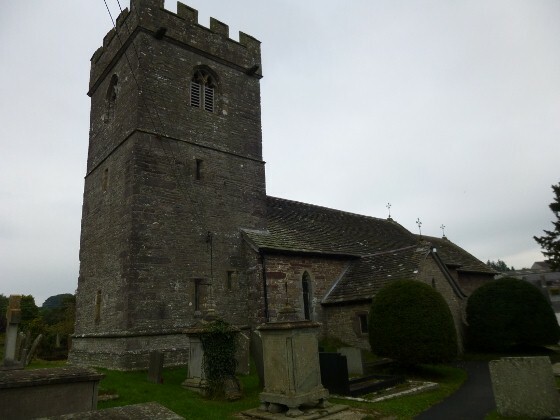 She was with sister Mary Jane Millington in 1911 and married Francis John Lewis (1873- 9 November 1925, died Cardiff Royal Infirmary) a 42-year-old widower from Roath, Cardiff in Llanfihangel Talyllyn on August 2 1915. Francis John's Administration gives his address as 41 Metal-street, Roath and his effects as £197 9s. 4d. left to widow Rosa Madia Lewis. She was at the same address in 1939. Annie Isabella Price (1883-1936) a dressmaker at home in 1901. She married Sydney James Lockhart (1885-1939) in Rochford in 1912. They had Sydney James R Lockhart (October 25 1912-1978) and Eric Ernest W Lockhart (November 22 1914-1981), also in Rochford. Sydney and Eric were at 15 Vincent Close, Thurrock, Essex in 1939 when Sydney was a Toys Stationery Salesman and Eric was an Insurance Agent. Sydney junior married Irene Cynthia Reynolds (April 3 1917-1985) in 1940 - she was a typist at a petroleum refinery in 1939. 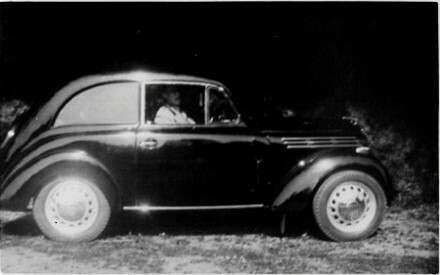 Eric married Margaret Mcclure in 1950. William James Price (born February 28 1884-1952, died Haverfordwest, Pembrokeshire) a railway clerk at home in 1901. In 1911 he was a colliery workman at 14 Albert Street Merthyr Tydfil with wife Mary Anne Thomas (May) (December 2 1885- May 12 1946, died Haverfordwest, Pembrokeshire) born Dowlais, Glamorgan and children William Clifford Price (January 7 1907- ) and Phillip Henry Price (15 July 1908- 14 May 1969, died Haverfordwest, Pembrokeshire) both born Dowlais. They also had Gertrude Nicholls (c.1901- ) adopted daughter, born Newport. In the 1950s a family list gave W J Price's address as 3 Great North Road, Milford Haven, Pembrokeshire which was the address they were at in 1939. Also on the 1939 Register was Florence Price (surname crossed out and replaced by Thomas, in lower case) born September 21 1904). Phillip Henry was at 25 Marble Hall, Milford Haven at the time of death. John Walter Price (Jack) (born May 1 1885-1959) was a colliery clerk living at 26 Nightingale St, Abercanaid, Merthyr Tydfil, Glamorgan in 1911 with wife Lilian Jenkins (c.1891-1939) and 8 month-old daughter. 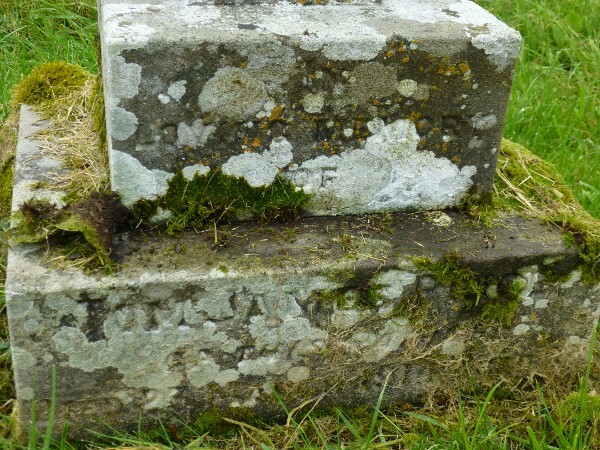 More about the family of John Walter Price and Lilian Jenkins. Ruth May Price (March 12 1912-1984) married Solomon Schratsky (February 13 1911- October 19 1944) Dec Quarter 1932 in Bethnal Green, London. Solomon died serving as a private with the Royal Electrical and Mechanical Engineers during the Western European Campaign. He was buried in the Schoonselhof Cemetery in Belgium (Commonwealth War Graves Commission). Annie Gladys Price (July 30 1913-1976) married John Nichols (1910-1998) Dec Quarter 1934 in Southwark, London. She was at 11 Alberta Street in 1939 with children, including Raymond J Nichols (September 13 1935 - ). Margaret Beryl Price (January 5 1916- March 8 1991) married David Morgan (December 13 1915- December 2 1985) Sep Quarter 1937 in Merthyr Tydfil. Resided at 11 Alberta St, Merthyr Vale, Merthyr Tydfil in 1939 and at death. 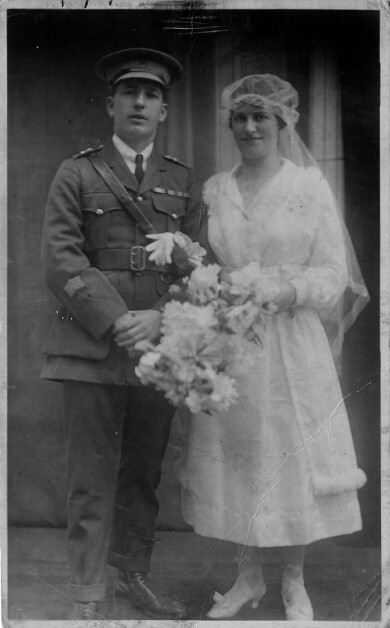 Sarah Anne Price (December 19 1917-1972) married George Thomas (November 24 1915-1981) June Quarter 1938 in Merthyr Tydfil. They were at 11 Alberta Street in 1939. Thomas Henry Raymond Price (1925-1979, died Bramalea, Ontario) married Doreen Crook (1925-1981, died Orangeville, Ontario) 1947 in Merthyr Tydfil. Florence Elizabeth Price (November 5 1927- May 1996) married William Roland Thomas (1927-2008) Dec Quarter 1946 in Merthyr Tydfil. Gertrude Maud Price born August 8 1887 and buried on October 27 1887. Annie Margaret Price born Sept Quarter 1916. Betty Price (December 7 1917- ) married Cyril Griffiths in 1945. Marjorie Price born Dec Quarter 1921. Married Thomas W Thomas and may have died in 1993. Delia Price (October 9 1926- ). A Delia Price died in Merthyr Tydfil in June Quarter 1948 aged 21. Prudence Ashfield Price (1922- February 2011; born in Merthyr Tydfil) married New Zealander Leonard Percy Fenton (c.1915- March 2 2013; died Whangarei, Northland, New Zealand) and had a son and daughter. Stanley Thomas Ashfield Price (August 8 1926- February 1994; born in Merthyr Tydfil, died North Walsham, Norfolk, England). Sidney Price (February 7 1893- April 1 1941) was a colliery labourer on surface living with John Walter Price in 1911. 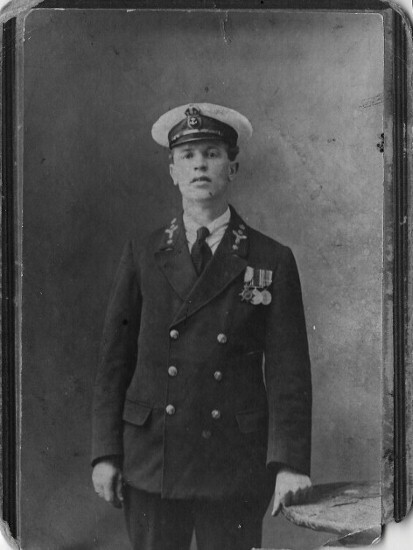 He joined the Royal Navy as a stoker on January 1 1914 and retired a Chief Petty Officer in 1935 (21 years service) to run the Wyndham Inn in Plymouth. 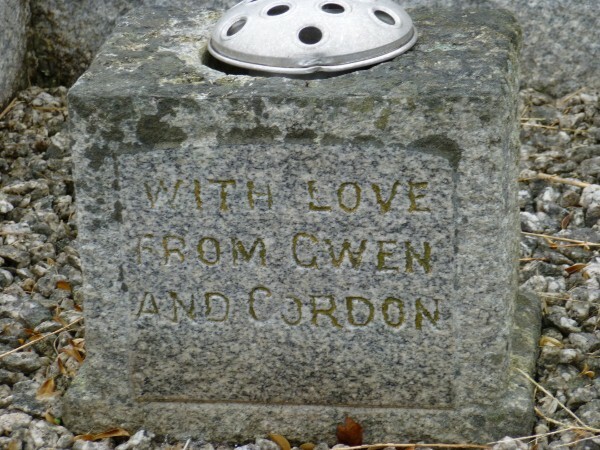 He married Charlotte Kathleen Serjeant (May 12 1903-1979) born Bodmin, Cornwall in September Quarter 1928. They had Joan E.K. Price (January 1 1930- ) in Plymouth, Devon who married Norman Taylor in 1952. Sidney died on April 1 1941, address given as 21 Anstio-street, Plymouth. Effects £585 8s 8d. probate granted to Charlotte Kathleen Price, widow. Charlotte married Lewis Barratt (1916-2003) in 1952. They lived at 73 Bridewell Road, Camels Head, Plymouth. HOME ON LEAVE. 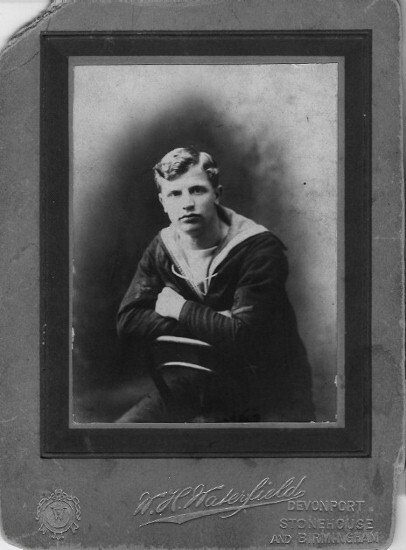 -We are pleased to see home on a few days' leave 1st class Stoker 1 Sidney Price, of one of H.M. warships. Price is a son of the late Mr Tom Price and Mrs Price, Griffin Terrace, and served nearly three years in the Navy. He has seen service in the Dardanelles and other places and in spite of his arduous duties he looks fit and well (Brecon County Times, October 26 1916). Rhoda Elizabeth Price (1894-1968) was baptised in 1908 but her baptism record shows her date of birth as May 15 1894. She was with her parents in 1911. She married 26-year-old railway clerk Arthur Powell (April 25 1893-1954) on February 16 1920. Both were living in Griffith Terrace, Talyllyn. Arthur was the son of engine driver Elijah Powell (1853-1911) and Martha Probert (1856- ). Arthur died on November 11 1954, address given as 9 Millwood-rise, Barry. Probate to Rhoda Elizabeth Powell, effects £1008 12s 10d. 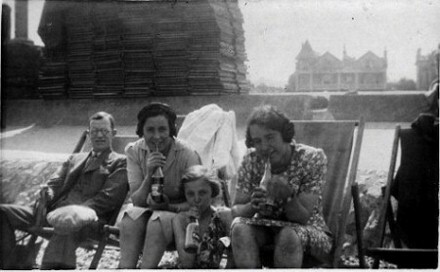 On June 2 1959 a Rhoda Powell born 15 May 1894 travelled to Montreal from Southampton on the Cunard Saxonia with Mary Moore and Edith Jones (both born June 1 1893) all giving their last UK address as 9 Millwood Rise, Barry, Glamorgan. Rhoda returned on the SS Empress of Britain (Canadian Pacific) to Liverpool arriving 25th August 1959. Mary Moore (on the same ship) gave her UK address as 27 Oxford St., Barry and date of birth as June 3 1888; Edith D Jones the address of Plas, Llangorse, Breconshire and date of birth June 1 1893. Whereas they had been shown as M (married) on the trip to Canada, they were S (single, including widowed) on the return journey. Edith was Edith Diana Williams widow of J R Jones. Mary Moore was probably her sister Mary Rebecca Williams (1888-1979) widow of Charles Edmund Moore. Rhoda and Arthur had daughters including Phyllis E Powell (December 10 1920- ) who married Leslie W. Millward in 1948. David Price was given a private baptism on November 15 1895 and buried on November 19 1895 aged 2 months. Rees Price (1897-1951) was baptised in 1908 but his baptism record shows his date of birth as December 11 1897. He was with sister Mary Jane Millington in 1911. 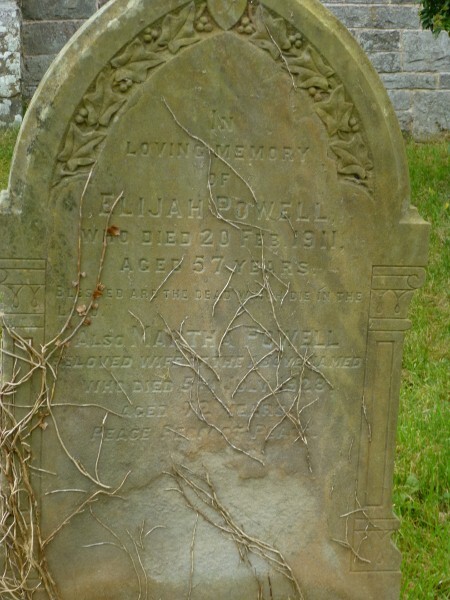 He died on December 3 1951 and was buried on December 6 at Llanfihangel Talyllyn with the address on his gravestone given as 6 Dingat Terrace, Llandovery. He was a Railway Clearing House Clerk at that address in 1939. 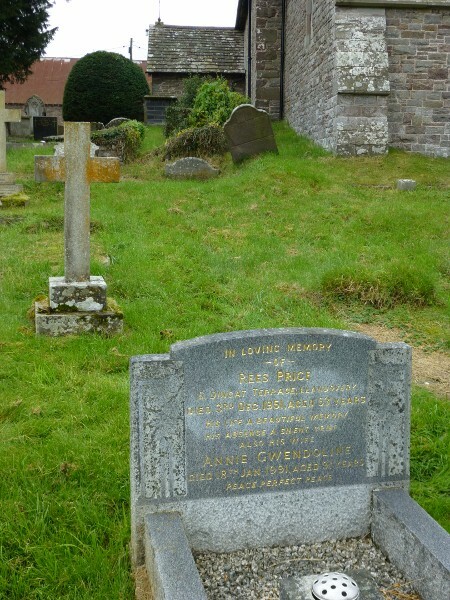 His wife Annie Gwendoline Davies (September 4 1889-1991) died on January 18 1991. They had a son.